Calvinism is back, and not just musically. 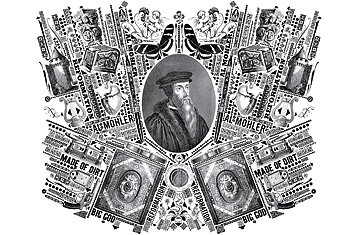 John Calvin's 16th century reply to medieval Catholicism's buy-your-way-out-of-purgatory excesses is Evangelicalism's latest success story, complete with an utterly sovereign and micromanaging deity, sinful and puny humanity, and the combination's logical consequence, predestination: the belief that before time's dawn, God decided whom he would save (or not), unaffected by any subsequent human action or decision. Calvinism, cousin to the Reformation's other pillar, Lutheranism, is a bit less dour than its critics claim: it offers a rock-steady deity who orchestrates absolutely everything, including illness (or home foreclosure! ), by a logic we may not understand but don't have to second-guess. Our satisfaction  and our purpose  is fulfilled simply by "glorifying" him. In the 1700s, Puritan preacher Jonathan Edwards invested Calvinism with a rapturous near mysticism. Yet it was soon overtaken in the U.S. by movements like Methodism that were more impressed with human will. Calvinist-descended liberal bodies like the Presbyterian Church (U.S.A.) discovered other emphases, while Evangelicalism's loss of appetite for rigid doctrine  and the triumph of that friendly, fuzzy Jesus  seemed to relegate hard-core Reformed preaching (Reformed operates as a loose synonym for Calvinist) to a few crotchety Southern churches. No more. Neo-Calvinist ministers and authors don't operate quite on a Rick Warren scale. But, notes Ted Olsen, a managing editor at Christianity Today, "everyone knows where the energy and the passion are in the Evangelical world"  with the pioneering new-Calvinist John Piper of Minneapolis, Seattle's pugnacious Mark Driscoll and Albert Mohler, head of the Southern Seminary of the huge Southern Baptist Convention. The Calvinist-flavored ESV Study Bible sold out its first printing, and Reformed blogs like Between Two Worlds are among cyber-Christendom's hottest links. Like the Calvinists, more moderate Evangelicals are exploring cures for the movement's doctrinal drift, but can't offer the same blanket assurance. "A lot of young people grew up in a culture of brokenness, divorce, drugs or sexual temptation," says Collin Hansen, author of Young, Restless, Reformed: A Journalist's Journey with the New Calvinists. "They have plenty of friends: what they need is a God." Mohler says, "The moment someone begins to define God's [being or actions] biblically, that person is drawn to conclusions that are traditionally classified as Calvinist." Of course, that presumption of inevitability has drawn accusations of arrogance and divisiveness since Calvin's time. Indeed, some of today's enthusiasts imply that non-Calvinists may actually not be Christians. Skirmishes among the Southern Baptists (who have a competing non-Calvinist camp) and online "flame wars" bode badly. Calvin's 500th birthday will be this July. It will be interesting to see whether Calvin's latest legacy will be classic Protestant backbiting or whether, during these hard times, more Christians searching for security will submit their wills to the austerely demanding God of their country's infancy.